So one thing I'm going to be trying to do with the blog is do shorter reviews and just get to the point quicker. We'll see how good I am at that. 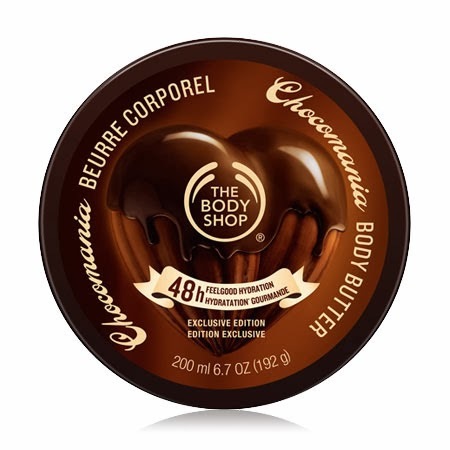 Recently, I placed an order with The Body Shop because they were having a great sale (and seriously, they're always having great sales but this was half off almost everything) and with my order they sent me a free sample of their Chocomania Body Butter. I haven't really gotten into using anything else I ordered but I went ahead and used up this sample. One thing to note about it up front was I hated the packaging of it. I wish I had taken a picture, but it was this very large packet, and once you actually squeezed the product to one end to use it, the product itself took up literally less than one fifth of the size of the packet. So the wasted space irritated me up front. That's not to say the sample wasn't generous, it actually had enough for me to use it for two days, which was nice. In the end, I think the actual body butter function was great, it was really moisturizing, it spread on quickly and blended into my skin quickly. I didn't feel sticky or weird after, which is one of my complaints with a lot of lotions and especially thick things like body butter. I'm actually quite glad that my order contained another one of their body butters, because I think it'll be great this winter when I'm really dried out and need something more severe than just an average lotion. The trick for me was the smell. I get that chocolate is fantastic, I love chocolate. But for one thing it didn't actually seem to smell quite like chocolate to me, it smelled like some sort of fake "this is kind of like chocolate but not really." And it wasn't good, I just did not like the scent at all. Of course, I should also point out that I tend not to go for any kind of thick or strong "baked good" type scent for bath products, I prefer lighter smells for that. So overall: yes to Body Shop's body butters, but no to the Chocomania for me just based on the scent alone.